Is this constructive and productive? Is it creating greater understanding? Does it preserve our relationship and the possibility of future conversation? The word “civility” has been on nearly everyone’s lips this week, especially after the president’s press secretary tweeted that she was asked to abruptly leave a Virginia restaurant. In the days since, the press, pundits, politicians and everyday people have weighed in on the incident, saying it epitomizes the ever-worsening tone of our politics. All this isn’t necessarily surprising — not if one looks back in American history and easily finds a tradition of coarseness in the public sphere. Likewise, the rumination about that coarseness in our politics isn’t new. To some degree, arguing is in our national DNA: Unlike most countries, formed around ethnic or nationalistic energies, the United States actually came to be because of an argument. Still today, our nation is rooted in a handful of core arguments that often defy resolution. It is this never-ending debate that, in many ways, defines Americanism. Discussions about how to form our more perfect union, of course, are not supposed to be easy. Today’s debates about immigration, trade tariffs, nuclear diplomacy, and any number of other powder-keg issues are as difficult as any throughout our history. When these things come up in the company of other people, it’s a modern reflex to retreat to an already-hardened position, and to let accusations fly. And when enough of that behavior occurs, relationships are damaged, people’s perspectives are silenced, only the loudest voices in the room are heard, and violence and disrespect become the norm. As a result, our democracy suffers. 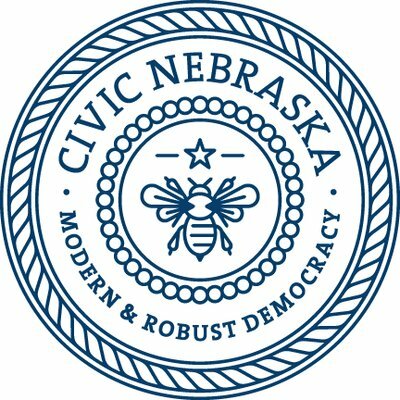 Civic Nebraska is often called upon to provide tools and training on how to move the needle in the opposite direction — i.e., to promote civil discourse. By the way, civility does not equal politeness. Politeness is tactfulness, refinement, and courtesy, often employing the direct avoidance of difficult conversations to maintain decorum. Civility, on the other hand, means that there should be certain shared standards of conduct toward others, with the agreed-upon notion that members of civil society should behave and interact in a way that benefits the overall good. Though it often feels better to shut down opposing ideas, take action against those who disagree with you, and generally make those with different viewpoints feel bad about themselves, please allow us to make a brief case for an alternative — having an authentic American conversation. That authentic conversation starts with yourself. Here are three guiding questions to consider that may help you, and our nation, find a healthier dialogue with others in these times. Yes, it’s tempting to show “the other side” the wrongness of their position, stance, or statement. You want to stand up for your beliefs by taking ACTION. But by making someone deliberately feel bad about themselves, you cut down on the productivity of a conversation. Their defenses come up, and the conversation turns immediately into debate – or worse, hostility. Civil discourse doesn’t have winners and losers. There is no scoreboard in a conversation that aims to be constructive. Rather than drive someone away from your dinner table, a more productive outcome would be to invite them to sit down, explain their position, listen, and then provide your perspective on the issue. “Democracy begins in conversation,” philosopher John Dewey said. Thank goodness the founders knew this. Problems aren’t solved by digging your heels in. Problems are solved when people listen, find common ground, and offer solutions based on that shared understanding. 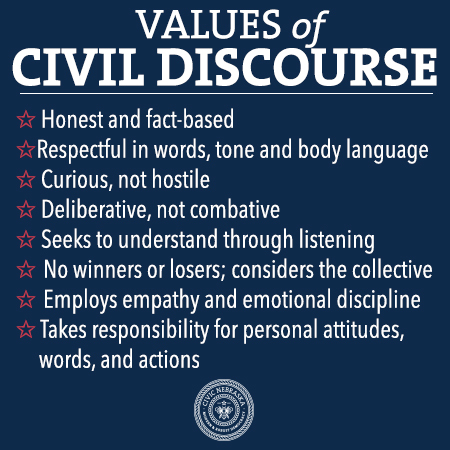 Civil discourse is fact-based and honest, which provides a pathway to common ground. Your conversations must first start with a genuine attempt to understand the logic and emotion behind another person’s beliefs – civil discourse can’t happen without it. This doesn’t mean you have to accept someone’s beliefs or “alternative facts” as your own. But understanding always helps spur the conversation, and potential solutions, forward. One of the hardest things to witness is a conversation that breaks down and creates a seemingly impassable divide. Family dinners can be unbearably uncomfortable when your aunt, grandpa, cousin, or stepsister have wildly different belief systems than you. Naturally, stories about relationships being permanently severed over politics are becoming more and more common. It’s important to remember that persuasion happens over time. If your aunt, grandpa, cousin, or stepsister don’t agree with you right away, that’s OK. Rather than taking pains to avoid one another for the rest of your lives, take time to examine where your beliefs diverge, why that might be, and then revisit the conversation when it’s more appropriate. Above all, remember that they are a person, too. And losing your sense of humanity only degrades dialogue. This just scratches the surface of some of what Civic Nebraska discusses in its civil discourse programs. For more information, contact us at civic@civicnebraska.org. We’ll be happy to talk … and, as it goes, we’ll be happy to listen, too.